FORT PIERCE – Drawing inspiration from President Ronald Reagan’s Star Wars missile-defense initiative of the 1980’s, scientists last week showed their progress on a laser bug zapper they said can specifically target Asian psyllids. Hundreds of growers from around Florida and other citrus-growing states and countries gathered at the Havert L. Fenn Center in Fort Pierce for the annual two-day Florida Citrus Show and learned they may soon have a new weapon against the bane of their existence: the psyllid. The small, winged, brown-speckled insect, first found in Florida in 1998 in Boynton Beach, mostly would be a nuisance except it carries the world’s most damaging citrus disease. Greening is a bacterial disease that slowly kills trees while reducing fruit yield and causing early droppage. It was first detected in Florida in 2005 and since has infected nearly 100 percent of the state’s mature citrus trees. Greening has left Florida growers with a 2016-17 grapefruit crop barely 19 percent what they grew in 2003-04. Production of Florida oranges last year was 28 percent of 2003-04 levels, and tangerines are down to 25 percent. The Indian River District produces almost 80 percent of Florida’s grapefruit crop, and about four of every five Florida grapefruit are shipped fresh to Asian and European markets, where they fetch relatively high prices. Most Florida oranges are commercially squeezed for juice and byproducts. Greening took longer to infect grapefruit trees, but over time they have shown to be less resistant than orange trees, putting the Indian River District’s biggest cash crop, and several hundred jobs, in jeopardy. What was a $9 billion industry for Florida a dozen or so years ago, barely touched $2 billion last year. And that was before Hurricane Irma in September caused growers to lose an estimated 40 percent of this year’s grapefruit crop, almost half the tangerines and more than one-third of oranges. Greening has been detected in California, Georgia, Louisiana and Texas, and mutated strains have been discovered in Africa and Latin America — including Mexico — and Brazil. Florida, however, is the front line of the battle against greening and its carrier. Research into solving the greening problem breaks down essentially into three areas: controlling or eliminating the psyllid population, developing combinations of scion (tree) and rootstock that are most resistant to greening, and finding a cure for the deadly bacteria huanglongbing (or HLB). 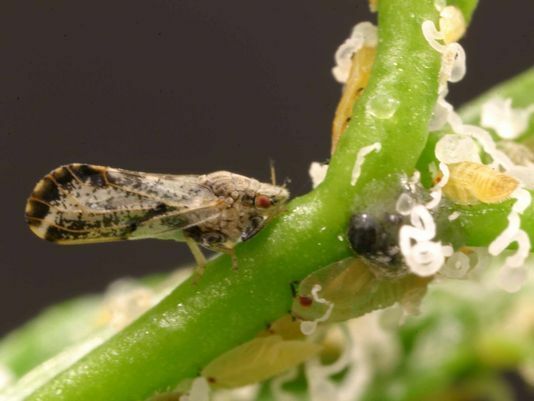 Several years ago, use of bait trees such as the orange jasmine or barrier trees such as eucalyptus, were tried as experiments to draw psyllids away from citrus trees, with little success. More recently, a tiny wasp known as the tamarixia radiata are being bred by the millions in laboratories around the state and released into groves because tamarixia lay their eggs in a psyllid nymph. After hatching, the larvae destroy the nymph. Now, a bigger gun is being developed. Joe Patt, a researcher with the U.S. Department of Agriculture lab in Fort Pierce, and Arty Makagon of Photonic Sentry, a company spun off from Intellectual Ventures, which was founded in 2000 and has been developing a photonic fence that targets mosquitoes, made their first presentation at the citrus show. Using commercially available equipment to keep costs down, the photonic fence can identify psyllids or other insects by their size, velocity and wing beat across a 300-foot-long by 10-foot-high path and uses an electromagnetic laser to kill them in mid-flight, as many as 40 per second. Psyllids, which have a wing beat of about 200 beats per second, less than half of mosquitoes, are not high-flyers, which is one reason they like Florida so much. The photonic fence would serve as a “depletion zone,” Makagon said. “We don’t expect to kill all, but hope to reduce the population by a couple orders of magnitude,” he said. Makagon said the photonic fence uses “spacial profiling” to separate harmful insects such as psyllids and mosquitoes from “friendlies” like bees. Field-ready units were deployed for functionality testing at the USDA research farm in Fort Pierce. Makagon said ports of entry and transit points likely would be the first places for installation, but eventually the company aims to develop a version for groves. The mosquito version is being developed for resorts, and eventually for residential backyards. Rhuanito “Johnny” Ferrarezi, an assistant professor of citrus horticulture with the University of Florida, is leading the multi-pronged research into developing trees more resistant to the HLB bacteria. Four different projects began four years ago and should be completed later this year. In a portion of the Fort Pierce research farm, trials are being conducted on three rootstocks and one scion plant breeders selected from among thousands of combinations they screened. The one or two best combinations from these trials will be recommended to growers to help them minimize the risk of new plantings. Ferrarezi said he also is conducting an anti-microbial trial to test chemicals in their effectiveness at killing HLB bacteria, an orange plant density trial to determine optimum fertilization and irrigation programs for orange trees, and a similar test on grapefruit trees to help determine whether the widely used microjet irrigation systems or drip systems, which use less water, are more effective. 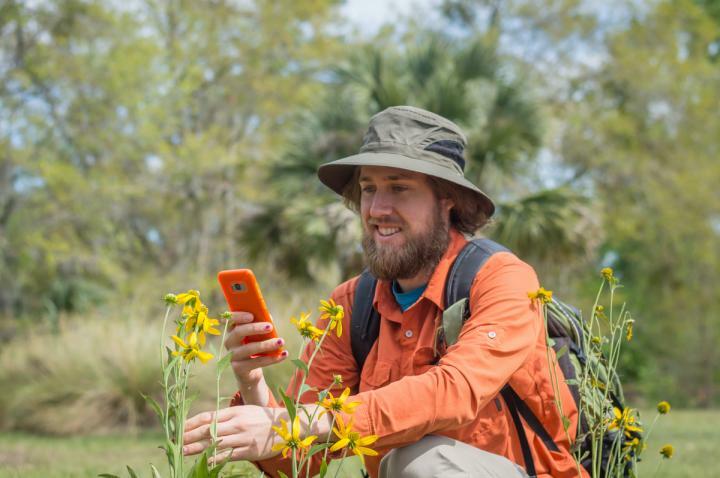 From years of greening research , researchers have concluded the HLB bacteria settles in a tree’s root system, stifling root growth, so the University of Florida’s Indian River Research and Education Center has brought in its first-ever root biology professor, Lorenzo Rossi. “Dr. Rossi’s root biology research will investigate the best conditions for strong root development and function so that citrus trees can suppress the symptoms caused by infection from huanglongbing,” said Ronald D. Cave, director for the UF/IFAS Center near Fort Pierce. Rossi, who completed a doctorage in agro biosciences/plant biology at Scuola Superiore Sant’Anna in Pisa, Italy, in 2014, is known for his successful research experiments in Italy with olive trees and in North Carolina, where he evaluated genetic and environmental stress on roots. Since then, Rossi completed three postdoctorate positions at Missouri University of Science and Technology, Texas A&M University and North Carolina State University. Rossi said his first study will be to examine how the bacteria moves from the leaves, where the psyllids infect the tree, to the roots, and where the bacteria lives and replicates. Previous articleCATCH THE BUZZ – NZ’s Honey Industry is Booming, Which Has Led to Brazen Thefts Which Police Believe May Be The Work of Organized Crime Groups. Next articleCATCH THE BUZZ – California’s Drought Restrictions on Wasteful Water Habits Could Be Coming Back — This Time They’ll Be Permanent!